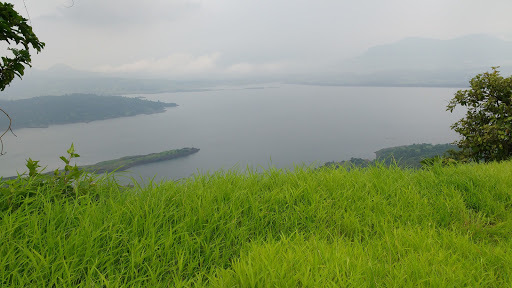 So another weekend and another great adventure planned by ‘Small steps adventures’ – A trek from Prabalgad to Irshalgad. 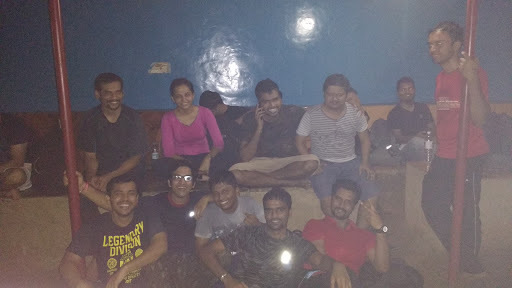 Trekking in the mountains of Sahyadris has become a hobby for me now and with great friends from Small Steps I enjoy more and cherish every moment. This range trek from Prabalgad fort to Irshalgad fort is the best option for trekking near Mumbai, rarely organized by Small Steps Adventures. 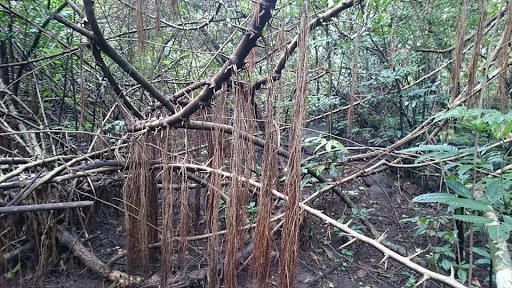 It’s an adventurous trek through dense forest on all sides. 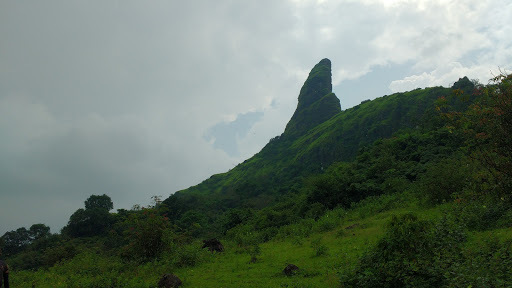 ThePrabalgad was built as a watchtower for Panvel-Kalyan region. It has a huge area nearly about 8 square km. Besides Prabalgad there is Kalvantin Durg with the valley in between. The shape formed is like impulse of a triangular wave and then constant from the second peak. We reached the base village which is called Thakurwadi at around 5.30 pm and started ascending which took about one and half hour to reach Prabal machi, which is a base of the fort. There is a small village situated where they provide food and shelter to trekkers. 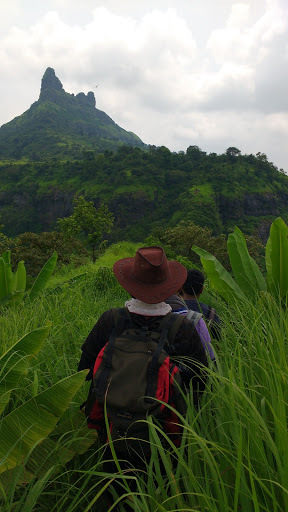 Kalavantin Durg trek also starts from the same base village. The night trek was fascinating as after some time it went completely dark and we were under the starry night. The torches were lit some had even brought headlamps and ahead we went. Trek to Prabal machi is easy, it has normal rocky patches and some slippery slopes but none too difficult as the treks I had done before. Basically, it’s a walk. As we reached Prabal machi everyone had enjoyed the trek and were little tired. We all started interacting with each other and intermixing into groups sharing our own stories and experiences of past trek. The village people had built a proper dining place to provide meals; as we started getting hungry the meal was ready. So the Vegetarians and Non-vegetarians were divided and as a vegetarian, I followed the veg group, the meal was awesome; the hot rice bhakris and alu bhaji with rassa is a wonderful treat after trekking adds to it with achaar and papad you have a feeling of home! 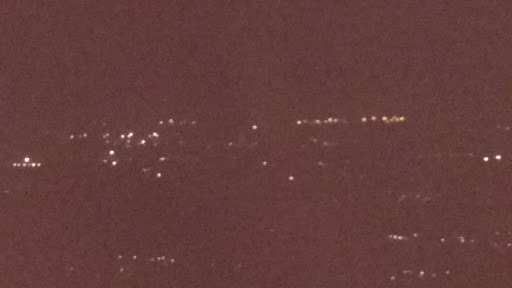 The view from Prabal machi is awesome; the tiny city lights are visible and somewhere flares of certain company can be viewed. We all sat on the ground in the cold breeze and were enjoying; as usual the singing of Bollywood songs followed. Then we retired to the quarters that are built for resting. The quarters has a large open space in front (aangan), we decided to sleep outside in pleasant climate; thus we took our shawls and mats set them up for sleeping. Actually nobody wanted to sleep early many people were trolling around, selfie’s, funny pics and dp’s everything was going, finally after sometime everyone retired to some sleep and as were deep in dreams dogs started shouting around at the exact moment that we were supposed to get up (3.30 am); and everyone’s alarms went going. Eventually in 45 min everyone was awake; after getting ready and having some breakfast and by the way thank god this time there were toilets and bathrooms near the quarters otherwise nature calls and the forest is your home..! 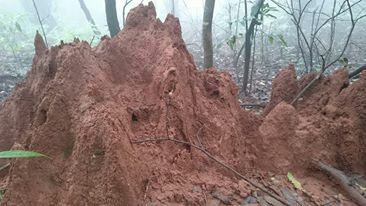 the anthills looked like small castles, gives you a sense how hardworking and creative ants are..! Walking further one reaches Kala Buruj (watch tower) of the fort. But to reach Irshalgad we had to take a different route. Some people went ahead to see the watchtower; so until that time we again took rest. With the encouragement of group leaders, everyone just moved forward without thinking of how much more we have to walk. As it was the walking around the mountain we could chat around more with each other. While trekking we had discussions on various topics. We had one guy who was a singer and also had been to Indian Idol but for some Personal reasons withdrew from it; also he is a great cook and works in VFX; wow great you never know whom you will meet in these treks. Once a CEO of some well-known firm had also trekked with us. 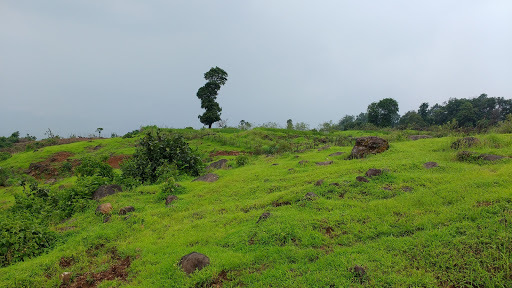 We further descended to a flat plateau from at the center from which on one side we could see Prablagad and on the other Irshalgad and down there was a river flowing parallel to the mountains. The scenic beauty was breath-taking. The huge Prabalgad looked like a giant rook; we were surprised to realize that we had walked the whole area of it. We were on the ridge now and could straight up to see Irshalgad. The ridge has wild Banana trees with big leaves that actually provided some shade; as at this point the clouds had cleared and the sun was shining brightly that too at the noon hour. The ridge was also a little slippery, so had to walk slowly on it. 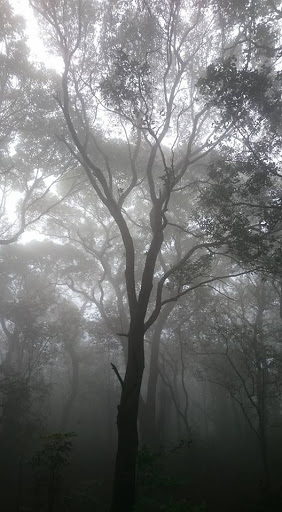 The trees around the ridge can give you grip to hold but some had leaves like blades and pointed spores on them; which can give cuts on skin, many did get cuts on their palms and fingers. These leaves are velvety and so you don’t realize at once. In this patch, people were really tired and their energy levels had come down to 50% because of sun and sweat. But somehow to reach our destinations we carried ourselves. As the ridge ended we had to climb down for several minutes and again climb up to enter in Irshalgad area. So we descended and ascended into Irshalgad The ascension was vertical and had to climb with taking a grip of hands-on rocks. Climbing a further we entered Irshalgad. As we climbed up into the Irshal the lush green farms and trees welcomed us we sat underneath the green earth and rested for a while. Different flowers were blooming in them just like our Bollywood movies. The fort was clearly visible now. But people were thinking more about the meal that was going to be served after some time. 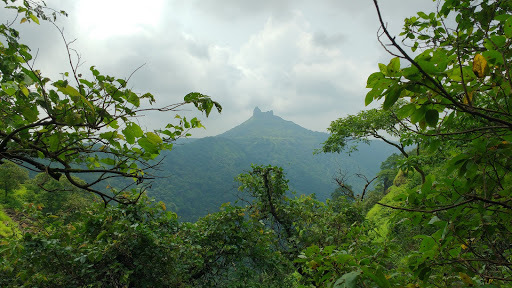 So walking further and the pinnacle of Irshal constantly with us; it was like Pinnacle was seeing us rather than we seeing the pinnacle; we reached Irshalwadi a village in the fort area. The Irshalgad is not a fort as such, more of watchtower from which the region could be viewed. Now the time for pinnacle but as I had already visited the top of the fort in my earlier trek I decided I would stay back in the village. Many people stayed back. Few with one of the group leader went ahead to the tower. Please read to climb the tower you need trekking equipment, it is a vertical climb and quite dangerous the other members of our group also went till the tower and not climbed it actually. At the top near the tower, there is a Rock which carved like a gate which has a needle hole in the centre and two Rocks like poles are naturally built on two sides of it. Making a shape like |0|. There are several naturally formed water cisterns in the rocks while climbing to the needle hole of Irshalgad. The water is cold and it is percolated from the rocks. One of the group leaders had directly come to Irshal with lunch; wow what a management! We were served with mutter “Paneer and Puris” it was heaven meal. The meal was obviously limited but no qualms about it. It was about 3 pm till we had finished our lunch and were waiting for the people who had gone up. We rested till then. As the other group came we started descending and they had their lunch. While descending the climate was awesome, cold breezes, little rains and green earth on all sides and at the bottom one could see the Morbe Dam. The climbing down of the fort did not feel like trekking at all. Descend was easy and without realizing we had reached the base village. The bus was waiting for us organized by the trek group. We put our bags and waited for rest of them to come down. Till then we watched the game of marbles that village children were playing also participated in it. 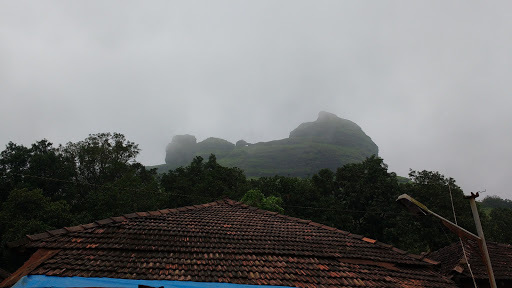 We had started our trek from Thakurwadi a base village atPrabalgad and we were now at the base village of Irshalgad. 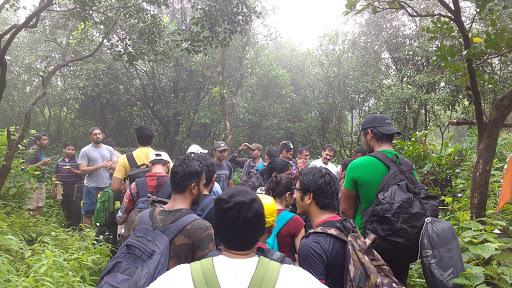 It was a great experience in many ways the trek gave us our first-time experiences like best ever “Jungle Trek”. · Built For: As watch tower for Panvel-Kalyan region. · Area: 8 sq. km. 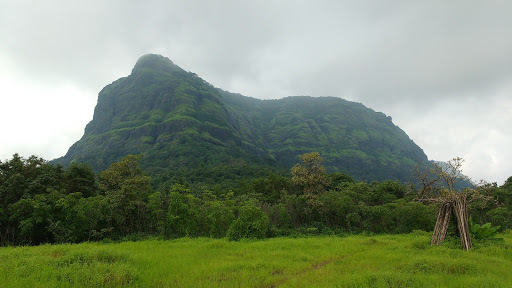 · Height: Prabalgad is situated near Panvel in Raigad district and is 2030 ft. from sea level. 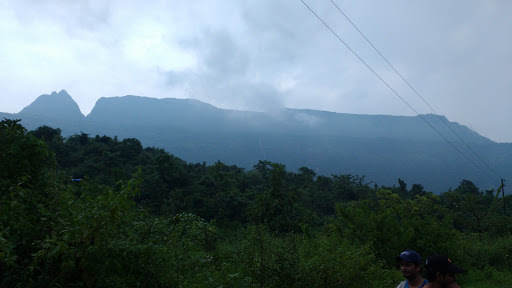 · Height: 3700 ft. from sea level near Karjat, Chowk village.